Consultants for the Hard Labor Creek Regional Reservoir project asked the U.S. Army Corps of Engineers in July of 2017 to bypass the public hearing process and allow construction of an intake facility on the Apalachee River to pump water to the reservoir in the future. The Corps indicated that it would reject the request for a waiver of a public hearing process in August of last year. That was before the Hard Labor Creek Regional Reservoir Board and the Walton County Water and Sewer Authority learned that the intake facility proposed to the Corps and included in the original permit was not workable and that an alternate site would have to be found for the intake. The Corps issued a Public Notice on Feb. 20 of this year seeking public comment, including via email, on the desired permit modifications by the end of the day today. Citizens can ask for a public hearing on the request for an extension of the permit from Feb. 28, 2019, to Feb. 28, 2021, and on the request for approval of a modification of the permit moving the intake facility from Walton County to a 202-acre-tract in Morgan County. Mark Nelson from Nelson Environmental Inc., a consultant for the reservoir project, told the Corps of Engineers in a letter dated July 13, 2017, that “there have been multiple opportunities for public input” on the project in the past and that the Corps should authorize construction of the intake facility without issuing another Public Notice. Nelson said before the Corps issued the permit on Feb. 19, 2004, it had sent out 815 copies of the Public Notice (officially called a Joint Public Notice) and that comments were received from 49 federal and state agencies, 35 private citizens, the Walton County Board of Commissioners, the city of Social Circle, the town of High Shoals, and the Southern Environmental Law Center. 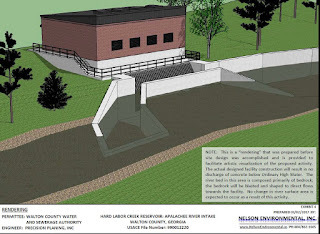 The public had the opportunity to provide input through “public information meetings, public presentations, and newspaper articles regarding the Hard Labor Creek Reservoir, including the Apalachee River intake site dating back to 1996,” Nelson said in his letter. The request for a waiver of the public hearing process was rejected by the Corps of Engineers, Jimmy Parker, project manager and senior vice president at Precision Planning Inc. of Monroe, told the Walton County Water and Sewer Authority and the Hard Labor Creek Regional Reservoir Board in a joint meeting on Aug. 15, 2017. Parker said he had learned in a conference call the previous day with Brannon, who is the new project manager for the permit held for the intake facility, that the Corps was going to require a Public Notice and 30 day comment period. Parker said he had been told earlier by former Project Manager Justin Hammonds at the Corps that the Corps did not want to grant another extension. “I think Elisha said ‘we feel this whole process is justified and therefore we’d look favorably on the time extension for this permit’,” Parker reported. “This public comment period is not about the reservoir project,” Parker said. “It is not about whether the reservoir is needed. Mark Saxon, who was a party to the conference call, confirmed Parker’s summary of the conversation with Brannon. “She didn’t throw up any red flags at all,” Saxon said. Saxon is an Oconee County commissioner and chair of the Hard Labor Creek Regional Reservoir Management Board. 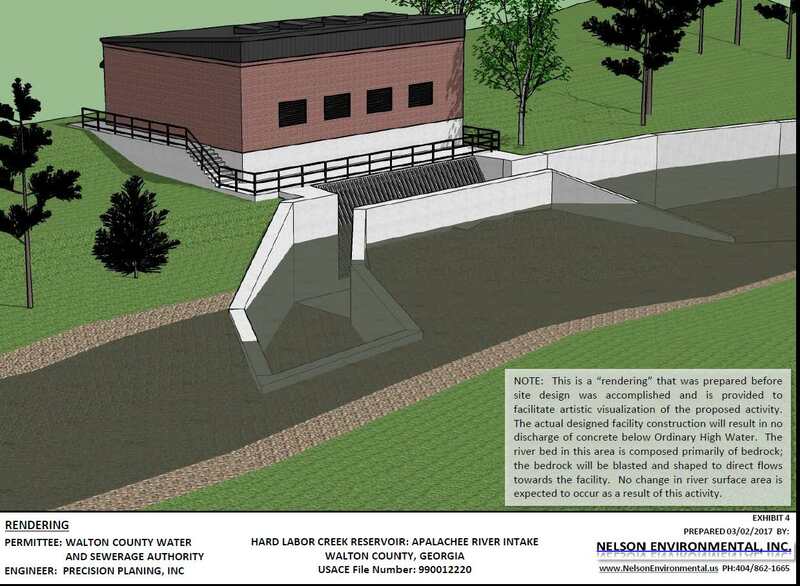 The Walton County Water and Sewer Authority holds the permit for the intake facility, but the project is a joint one between Oconee County (at 28.8 percent) and Walton County (at 71.2 percent). Nelson told the group there also would be a focus on the impact of the intake facility on the High Shoals Historic District and on noise generated by the pumps in the intake facility. Nelson’s firm, Nelson Environmental, is located in Flowery Branch in Hall County. Sometime after that Aug. 15, 2017, meeting, the Water and Sewer Authority and the Management Board learned that the original site at the power plant, which has been in the permit since its issuance in 2004, was not going to work. Federal restrictions on use of the water in the pool of the dam for the power plant would require the approval of the Federal Energy Regulatory Commission and the permit holder, according to Parker. The permit is now in the hands of Jason and Carol Victoria Presley. Carol Victoria Presley is the daughter of Gaynor L. Bracewell, who built and then operated the 1,027 kilowatt power plant from 1981 until his death in 2006. 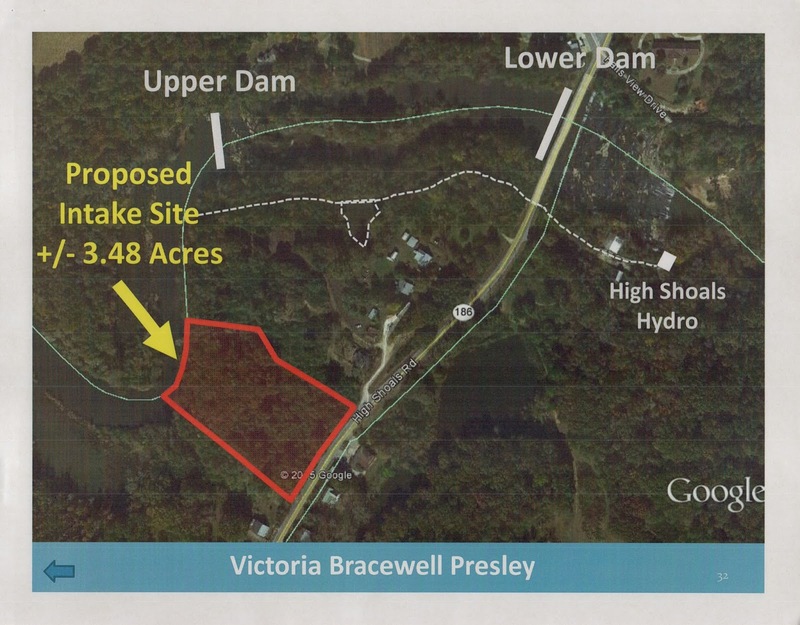 Parker said that negotiation over the 3.48-acre-tract between SR 186 and the Apalachee River owned by Victoria Pressley that was to be the location of the intake facility and over the use of the water upstream from the power plant broke down. That information was never revealed in public at a Hard Labor Creek Regional Reservoir Management Board meeting. On April 25, 2017, Brannon and David Pugh from the Corps met with Parker and Rob Gross of PPI at the Presley intake site, according to the letter environmental consultant Nelson sent to Brannon on July 13, 2017. As a result of that meeting, Brannon asked for an evaluation of alternate sites for the intake facility. Nelson provided her with four sites, three above the upper dam on the Apalachee River above the power plant and one downstream. Parker said the three upstream sites have been rejected because they are covered by the federal restrictions on water use above the plant. The downstream site was rejected because it is owned by Presley, Parker said. Sometime in December, the Walton Country Water and Sewer Authority entered into a 150-day purchase agreement for 202 acres on High Shoals Road in Morgan County owned by Robert Pennington Land and Timber IV LLC. The purchase of land is one of the activities of governing bodies that can be discussed in executive session without public notice or involvement under the state’s open meeting law. The Feb. 20 Public Notice issued by the Corps specifies the Pennington property as the one to be added the permit to replace the site on the Presley property specified in the existing permit. The Public Notice specifies that the Corps is soliciting “comments on the proposed impacts resulting from construction of the Apalachee River water intake structure ONLY,” even though the Notice also covers the request for a permit time extension. Rock rip rap would be placed on both sides of this concrete wall. The intake also would require excavation and reshaping within the river bed to align river flows toward the intake facility, and approximately 270 cubic yards of streambed is proposed for removal. A road crossing of a perennial stream to accommodate access to the intake facility would require 60 linear feet of stream impact, the Public Notice states. “Detailed designs of the road crossing and how the intake facility will be installed within the Apalachee River (i.e. all temporary impacts) have not yet been submitted for the Corps review,” the permit states. Water from the Apalchee River would be pumped from the intake facility all the way to reservoir. The reservoir is now near full stage with water from the Hard Labor Creek basin, but no water treatment plant or distribution system has been built because neither Oconee County nor Walton County has a need for the water at present. The intake facility would convert the reservoir from its present status to a pump-storage facility to allow for expansion of the capacity of the reservoir at some point in the future. Water from the Apalachee would supplement the water from the Hard Labor Creek basin. No details of that water line, parts of which would run through Morgan County, have been provided. Following that April 25 meeting at the Presley property, Brannon requested additional information from the Walton County Water and Sewer Authority, according to Nelson’s letter of July 13, 2017. The first was the identification of the four alternative sites, which Parker said have now been rejected. The Corps also wanted a map illustrating the routing of the planned water line from the pump station to the reservoir, details of construction techniques, disposal sites for materials removed from the river, and information on blasting in the river. The Corps also wanted to know the area and volume of concrete below the high water mark on the river and the extent of permanent wall structure that extends to the river from the intake facility. Nelson provided answers to some of the questions on the list with his letter, but these were for the original site and the four alternates identified at that time. They did not include the Morgan County site now under consideration. According to the Public Notice, requests for a public hearing on permit modification and extension can be sent to Elisha A. Brannon by email at Elisha.A.Brannon@usace.army.mil, by the end of the day on March 22.